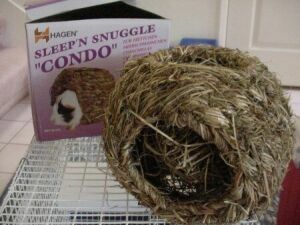 This large size ready made nest works well for even the biggest of rats to climb in and out and sleep in. My rats, both girls and the boys, enjoy curling up and sleeping in one of these. It fits easily into most any size cage. The only drawback is that my girls like to shred the straw over time, leaving just the wire frame, and priced at approximately $12.00 this product can become expensive to replace on a continuing basis. Overall I would rate this as 3 paws if the price is not an option.